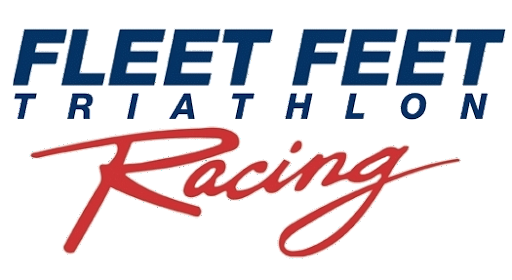 Congratulations to all Fleet Feet Triathlon Team members that participated in the 2014 10th Annual Monster Triathlon. I arrive a few minutes later than I wanted due to a wrong turn on the way out from Tullahoma still had plenty of time though. I go to get my race packet and shirt. The first thing I see is my runner bib. Then it hits me “I forgot my race belt”! So on the way back to the truck I’m thinking “what else did I forget, I think I’ll just pin the bib on“. Head out to set up transition and pick a spot that I can remember, set everything out and start to pin my bib on. I then think “I have an extra shoelace in the truck“, I go get it and it works. I just have to tie it on but no biggie. Swim start and I am ready for this. I have had some trouble in the past with open water swim. I have gotten over this and enjoy them now. The weather this year was great and the water was smooth. I make it to the first buoy and have already passed at least one person. Right turn and I remember 6 buoys to pass. I pass several swimmers and may have been passed a couple of times. One thing about a time trial start with race number on your swim cap, you can see if you passing someone that started ahead of you easily. Two right turns and then one left to the finish. I come out of the water and see my time a little over 16 minutes. This is a little slower than last year but it was wetsuit legal then and not this year. Quick transition and onto the bike. The bike was decent and I didn’t remember this many hills last year. Several times I thought I was going to just slow down and just finish. I kept after it and those feelings went away. Around mile 12-13 there was a big group ahead of me and I noticed some dogs chased after them. I’m the next target for the dogs! I get closer thinking they are going to give me a chase but they are just hanging out at this time, good deal. About a mile ahead I am chugging along in my on little world thinking about my next transition when I hear what sounds like a dog chasing. I look to the right and it appears to be the worlds largest dog. I’m looking at his feet and have to look up to see his head! Thankfully he doesn’t get to the road. Finished up the bike and head toward the bike rack. Hang the bike up, grab my shoes, visor, and my shoelace race belt. I’m trying to run a steady pace and quickly get into my grove. My ability to do math in the late stages of races is kind of funny to me. I’m wanting to run the 4 mile in under 30 minutes so I think “as long as I maintain a 8:30 pace I’ll be good” I know that wrong but I’m thinking this! First mile was 7:20ish and keep after it. At the 3 mile marker I see my time was 22:30 and I think “that’s a 8:30 pace so I should be in under 30 minutes”! Again my math is wrong but I’m just trying to live at this point! The last mile I get passed a time or two and make my mind up to finish strong. Run time was 29:31 which is 7:23 pace. I’m happy with the race. This is a great event and great spot for a triathlon. I grew up, graduated high school , and went to veterinary school in Raleigh. My parents still live there, so I have a long history of swimming, biking, running, and drinking in the City of Oaks. Of course, my biking history there is more of the banana seat and streamers variety, but still, it only seemed natural that I sign up for the second Raleigh 70.3 as a tune up for Lake Placid. But as you all know, when you sign up for races 6 months to a year ahead of time, you can never predict where you are going to be in your training, especially since most of us are juggling full time work and families along with our training. And then there are those pesky injuries that pop up now and then just to keep it interesting. So by the end of April I was thinking of Raleigh 70.3 as more of a wake up call than a tune up race. It’s a good thing I don’t actually use a training plan, because I would have had to trash it anyway due to missed workouts/races due to family/work obligations and a wonky knee. But enough about that, you all struggle with the same stuff, and know that sometimes it all comes together and sometimes it all falls apart. On Thursday I loaded up the family and my gear, and we made the “9 hour” drive to Raleigh. I was on the phone with every Toys R Us store between Scottsboro AL and Raleigh NC trying to track down the Anna and Elsa Barbie dolls. Friday was my daughter’s 6th birthday, and she wanted the dolls from Frozen. There had not been one in Alabama for the previous 2 months, and they were sold out online. This turned out to be only slightly less exhausting than a 70.3. We found an Anna doll in Hickory NC and they promised to hold it for us until we got there. Durham was the only store that had seen any Elsa dolls recently and they had sold out the minute they opened on the morning after the truck arrived. Cary had a truck coming in that night, but the manager wasn’t sure if they were getting any Elsa dolls. So I promised Dannan we would be at the Cary, NC Toys R Us at opening the next morning. We arrived at my parents’ house in Raleigh after a 12 hour drive, but we had an Anna doll and a chance for an Elsa. Friday morning Dannan and I were standing outside Toys R Us with about 7 other Moms, but I wasn’t worried because I was pretty sure I could out-run all of them. If it came to wrestling match, two looked like they could take me. When the doors opened, I sprinted to the Frozen section and snatched one of three Elsa dolls, dragging Dannan behind me. We did a happy dance, took pictures, and the nice manager gave Dannan a birthday crown and a balloon. I was feeling like Mother of the year, let me tell you! But now my race report is going off the rails just like my training. I picked up my packet on Friday to avoid the crowds, which turned out to be a good call because when I went to the athlete briefing on Saturday there was a long line. I met up with Marty and Carol Eason at the athlete briefing before going out to Lake Jordan to drop my bike off at transition. I drove the bike course with my Dad navigating, and it looked scenic and fast for the first half, with some rollers in the second half. My Dad kept saying things like “I think you are nuts” and I think he was only partially talking about my penchant for swimming, biking and running long distances. When we got back home I painted my nails purple (tradition) and ate a hearty early dinner cooked by Mom. Much better than eating out the night before a race! Race morning started at 4 am and my husband drove me to T2 downtown where I set up my running gear and caught a charter bus to the swim start. They did a good job getting 2500 athletes and their spectators bussed from downtown to the swim start (40 minutes) in a short time. At first it seemed annoying to not have parking out by the swim venue, but in reality it kept the traffic down in the early part of the race. It also discouraged families from driving along points of the bike course to try and see their athletes, because they would have just got stuck in traffic anyway. Raleigh did a good job of clearing most of the roads we were on of significant traffic, but I saw many backups on the roads we were crossing and was glad my family was safely back at T2 ready to see me start the run. My husband gave me advice when he dropped me off: “Don’t drown, don’t crash, don’t trip.” He’s so wise. I saw my family as I came into T2 and again when I left T2 on the run. I knew this part would be bad, since my running mileage has been low to non-existant since Mountain Mist. But in the past month my knee has been feeling much better, and I had made a 10 miler a few weeks ago with no pain. 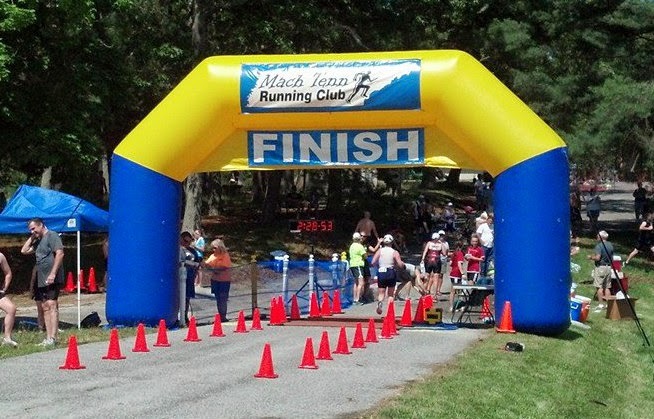 Consequently the first loop felt decent, and I made sure to walk all the aid stations (at every mile – I love triathlons! They spoil us!). I saw my family again at the turn around to start the second loop – it is amazing how awesome it is to have people who love you unconditionally supporting you at these events. When you see them, you realize how much they must care to stand out in the hot sun just for a chance to see you once an hour (or less) not to mention what they put up with for your training. So I started out on the second loop feeling hopeful that I could hold my pace. Ha! Somewhere between mile 9 and 10 the legs got heavy and my body explained that since this was the furthest I had run recently, and since my weekly mileage at times didn’t even add up to 13.1 miles unless I counted walking dogs, we would now be walking. Yuck. But I saw Marty Eason carrying the American flag and that inspired my to jog a little more and then I saw Carol starting her run looking bright and cheerful so I jogged some more and FINALLY made the turn where the finish line was in sight. KatieBeth Pierson cheered me on as I tried to speed up and look like I was in good shape (cameras do wonders), and then I heard my name announced and was across the line in 6:03:14. (2:17:47 for the run) This was about what I expected to do, so I was happy and I immediately sought out the family and basked in their admiration. There is no better feeling than finishing a tough race and seeing people you love and respect look at you with love and respect. (Post-race euphoric gushing) I needed to hit the road back to Scottsboro so we collected my gear and skipped all the post race hoopla. I took a short soak in my Mom’s whirlpool, ate leftovers of Mom’s cooking from the night before (sorry Ironman, but that’s better than anything you ever serve), and by 3 pm Bill and I were on the road back home. We left the kids behind with my parents, so as soon as Bill and I have caught up on our sleep we are going to have a romantic week with the house to ourselves. We are hoping to have caught up on our sleep by Wednesday. Overall, I was impressed with my hometown and thought they did an excellent job with this 70.3. There were a lot of officers on the course, and some major roads were either closed or partially blocked off so that we could race in safety. There was an unfortunate incident, but it was because a driver ignored the cops and she was charged and the cyclist suffered serious but thankfully not life-threatening injuries. Crowd support was awesome, and I hope that the people stuck in traffic snarls weren’t too inconvenienced. There were signs all over town and articles in the paper warning about the delays for a week ahead of time. And of course, an event this big brings a lot of money into town, so I hope that Raleigh continues to support and host this event for years to come. If you are thinking about doing a 70.3, I highly recommend it. The point-to-point format has a few logistical challenges that you need to plan for, but I enjoy racing point-to-point as a nice change from the usual. Of course, I had the added benefit of home cooked meals and a familiar bed, which added to my positive race experience exponentially! Congratulations to all of the Huntsville-area athletes who finished the race. It was great seeing familiar faces on the course. PS My husband says that triathletes in line for port-a-johns are particularly cranky when a 7 year old boy sees them and, not realizing there is a line, heads straight towards one. I tried to explain about pre-race jitters, 30 minute waits while trying to get to the swim start on time, etc, but for future reference maybe we should tone down the vehemence with which we inform the 7 year old that there is a line and he can not skip ahead, no matter how cute he is or how badly he has to go.